Ultra HD market is driven by capture, content, and display. Let’s see where we are with those to see how they will affect our media in the future. This is the Achilles heel right now, and I bet it has every major TV manufacturer out there feverishly working on it. This article about CES talks about TV timing for the future. It’s still another 6 months I’d say until your rich friend has one. It’s probably 2014 until a lot of your friends and maybe you do. The current state is on this Wikipedia page. Basically TV’s are $11,000 and monitors are $5,500. Just wait though. Ultra HD (4K) content is currently a You Tube novelty and a JRR Tolkien fan annoyance. (For the record I liked the 4K 48fps version after my brain adjusted) Here’s a beautiful example of it on You Tube. Realize your display can’t show this video in full resolution yet. The Red One has been out for years now offering 4K capture for the likes of Peter Jackson and his friends. Since then lots of cameras have come out. Right now they run about $5,000. That is until the Hero 3 Black edition (although only at 12 fps) for $400. I imagine all major DSLR makers are a matter of months away from having something to offer. Expect them to be released first on the prosumer DSLR line (Rebel), since it’s fastest to innovate. This will drive the displays to hasten up. Click for full resolution Ultra HD. Yes, sorry, you will have to buy an Ultra HD player. I wish internet speeds could handle it and internet movie providers could just pump it out over the air. Seeing how the files are 4 times as large, I just don’t see that happening unless some major re-engineering happens to internet speeds. I tried watching those You Tubes movies. The download bar was like watching paint dry. Watch the trends for your field. It’s going to come fast, I think. Before you know it, your customers are going to ask you if they can have their video in Ultra HD and walk next door if you say no. 62% the pixels of Ultra HD. Standard 1080 monitors are 25%. The capture resolution of stills has long since passed the 8.2 MP of Ultra HD. Your images will look stunning on digital display for a long, long, long time. Images are being shared more and more digitally. Even images you intend to be printed as your final product may in some unfortunate circumstances have to be seen digitally before they can be sold and then printed for the customer. Because of this it may be wise to consider how you’re cropping your images. The 16×9 of our TVs today seems to be a fad in images and I don’t think it’s going to go away. The images look so much better when they fill the screen. The prints actually look great too. that ratio is very pleasing to a print. Here’s where it may matter a little more to you right now. If you frequently make movies from still images you may be used to capturing images at lower resolution because you are dealing with thousands for a short slip. Watch that you stay above the future magical number of 3840 by 2160. 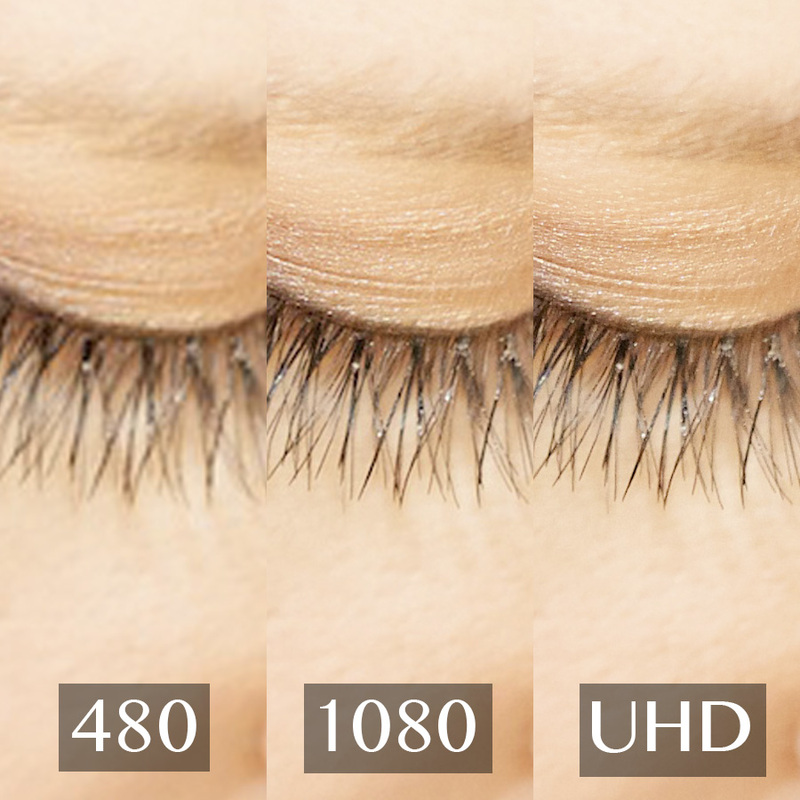 You can get Ultra HD from 1080 footage with a few tricks. Cinematographers have been doing this for a while to make SD footage go on a HD reel. These technique may seem a bit low. That’s because they are. Being able to sell your videos as “4K ready” right now may be a huge selling point though. Incorporate Stills- Cut often to stills that are at full resolution. Do Ken Burns on those stills. Backgrounds with Ken Burns video- Put your videos on top of something, like a hazy moving texture. then let the video float around, slightly zoom in etc… It’s kind of like what Ken Burns did with pictures. Stretch it- Just stretch it out and just deal with the pixels show. Beautiful? No. Functional? Yes. Action shoots fudge- Whenever there is motion the object moving will be blurry based on the shutter speed/frame rate thumb rule. This means stretching won’t be as noticeable as compared to a slowly moving shoot. Beautiful? Still no. Ultra HD Texture- Overlay a texture for and classic feel or an edgy feel. If the overlay is full resolution the video will look better. 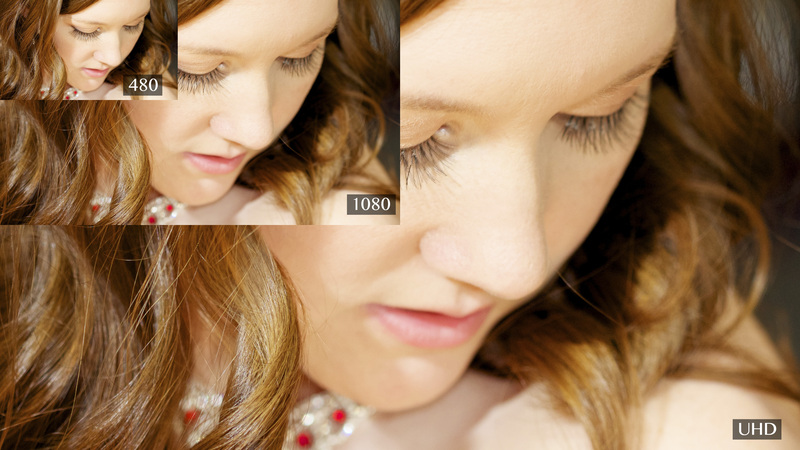 This is one of the tricks photographers have been using for years when they get a bad shot but the moment was just right. It’s called Instagram. It’s often used like putting perfume on a stinky pig. The discussion of the cinematic effect and pros and cons of various frame rates is a pretty huge debate. I just wonder what will happen for the trend of professionally made consumer movies when the cinema goes 48fps. Remember you can always remove frames. It’s much harder to add them in. My advice would be to capture at the highest resolution. That’s probably 1080. Then the highest frame rate for that resolution. Then if you shoot 1080 60p but know you’ll only be using 24p just make sure you broke the shutter speed rule. For example if you shoot 1080 60p but know your output will be 24p I’d shoot 1080 60p 1/60. This way your output will obey the rule (mostly) but you’ll be kind of ready if that trend goes to higher frame rates. 3D TVs and theatre has come without any noticeable effect on the photographer or even the consumer based videographer. What is the future of 3D? Do these two professions need to take notice? There may be a lot of 3D TV‘s in homes. There may be movies coming out in 3D. Look, however, at the new TV’s being sold. I think it’s a telling tale that 3D at home has a limited future. As a visual artist, I don’t think you need to worry about 3D when serving the consumer. I think the future is in increased resolution and possibly frame rate. Nice post. After watching the CES news roll in I’m excited about my next TV (4K in ~3 years). My MBPr will be good in the mean time. As far as content delivery goes, however, I’m thinking that in the next few years you’ll see more fiber to home (Google, Verizon) as well as better compression codecs which will take size down for streaming considerably. Netflix seems to be taking a proactive approach to getting this problem solved. They already do a lot of work with ISPs to get their content staged as close to the end user as possible.